Confession: I wasn’t sure we were going to be overwhelmed by the landscapes in Cappadocia. The fairy chimneys and rock formations are impressive, but in photos they tend to come off looking a lot like… well, Utah. And Arizona. And the American southwest in general. While those locations are incredible and we love the national parks in the area, they’re also located within a couple of days drive of where we grew up, so they don’t feel terribly far-flung and exotic to us. I worried that we’d have the same reaction to Cappadocia that we did whenever we saw the landscape of inland Malta, which looks remarkably like Texas: bemused confusion at how we traveled so far to end up somewhere that looked so much like home. We didn’t need to worry though: both the landscapes of the southwestern USA and Cappadocia are fantastic, but in person, they don’t resemble each other nearly as much as we suspected from photos. The architecture of the villages here, the peculiar landscape formations, the fairy chimneys reaching into the sky that are home to cave hotels, mosques, the unique things to do, and more are pure Cappadocia–and yet another reason to love Turkey. I’ve been hesitant to write about Cappadocia, because try as we might, we didn’t exactly travel Cappadocia as bloggers and researchers–normally, we’re taking notes, hitting up all the major highlights we can reach, doing price comparisons, and ensuring we can put together detailed guides after the fact. 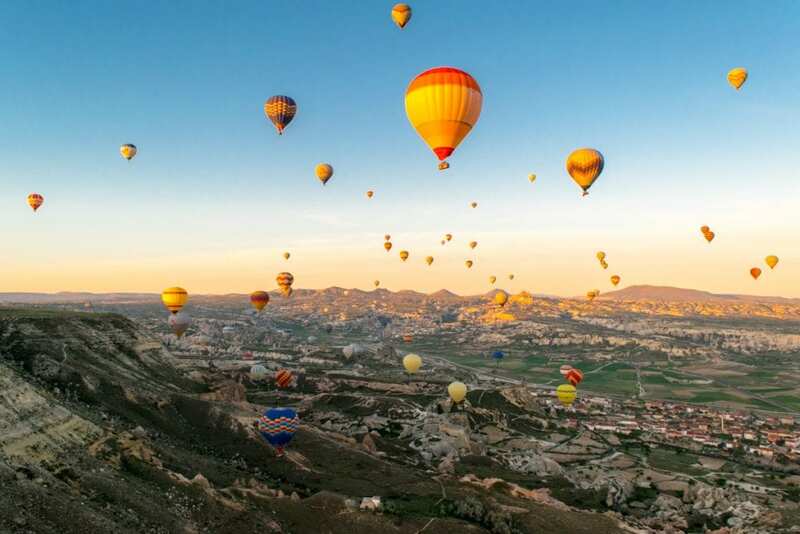 In Cappadocia, that didn’t happen: instead, we got caught up in a series of magical moments and drifted through our days there with as little direction as the hot air balloons of Cappadocia that dot the skyline each morning, and realizing, once again, why it was so easy to fall in love with Turkey. And two months later, this is what we remember the most from our 2 days in Cappadocia. This may be the first airport in the world to make me giggle at the sight of it. When we step foot onto the tarmac in Cappadocia, we are quickly hustled across the (tiny) landing area to baggage collection, and I am utterly amused. There is one small baggage claim belt. The door we entered from and the exit of the airport stare each other down across a maybe 150-meter distance. 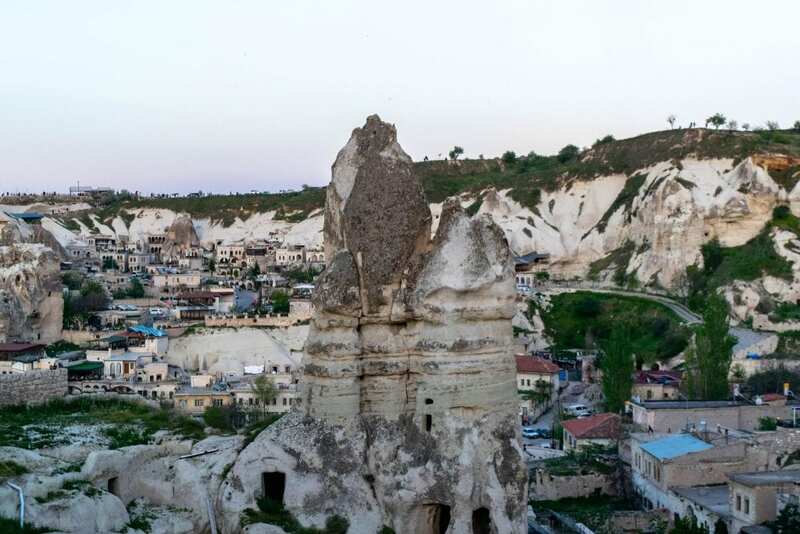 It is tiny, it is adorable, and we are already enchanted by Cappadocia. The hot air balloon drifts slowly through the air, and I am in awe of two things: the view, and how my fear has melted away. 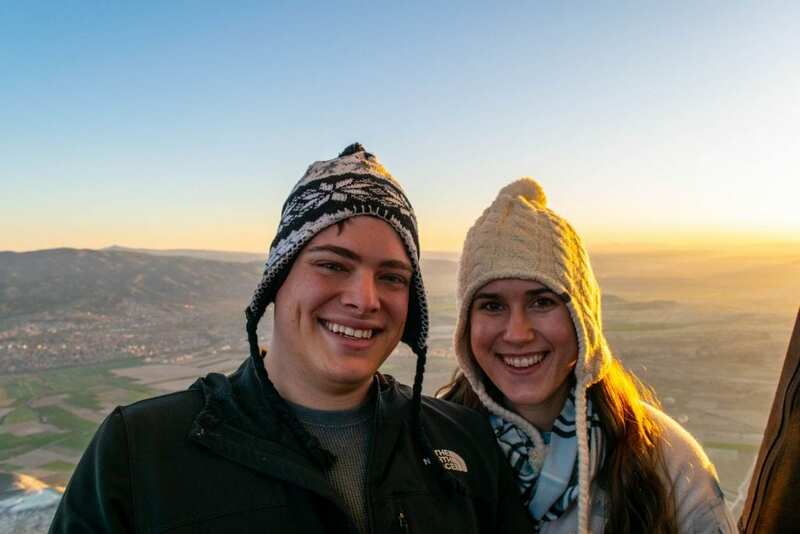 Up until we were in the air, I wasn’t sure how my fear of heights would handle being suspended in the sky by some carefully measured gas, a tarp, and a wicker basket–but the balloon ride is too relaxing for me to care much. 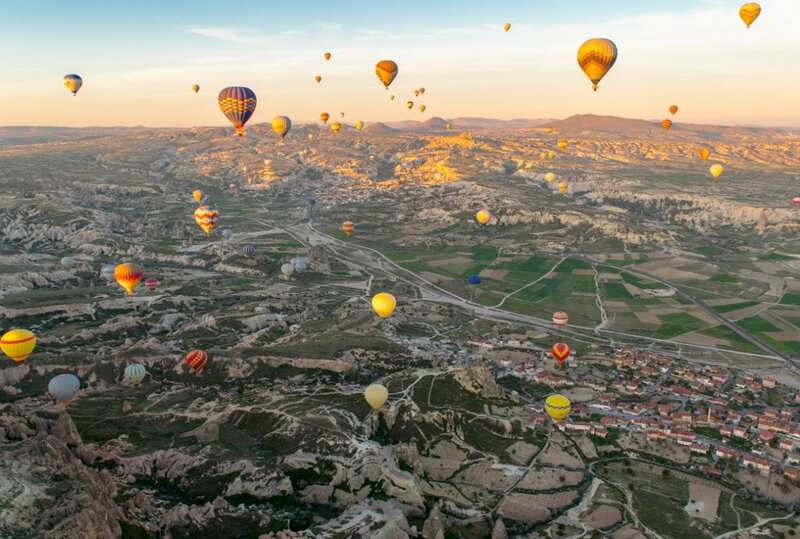 I am too distracted by the gentle beauty of the colorful balloons alongside us, the fascinating crevices in the Earth below us, and the unique perspective of being high above it all to care much about the risks of being up so high. I am thrilled by my capability to forget: this moment alone is worth traveling to Turkey, and I would never want to miss an experience as blissful as this. We are bent almost in half, moving through a dark cave, marveling at how we never knew it was here. An entire city underneath the surface, invisible from above: how did we never know this was here before? We learn that early Christians used these cities to hide from the Roman Empire once upon a time, hiding in the dark for up to two months at a time. It is fascinating, and we are enraptured: this is yet another reminder of just how much history there is in this world, and how little of it any single human will ever be privileged enough to know. I am clinging to Jeremy’s waist, my face buried in his back to protect against the dirt. I’m not sure what I was expecting from an ATV ride through Cappadocia, but somehow I didn’t manage to think about this much dirt coating my face, my hands, my clothes–we are both such a mess. But that’s okay: with every stop, the fairy chimneys and caves of Cappadocia open up more beautifully in front of us. Trees decorated with evil eyes dot the landscape. With the exception of a street food stall and souvenir stand or two, signs of human habitation melt away. This is a view of the Earth like none we have seen before. Our cave is particularly cozy. The rock walls reach up around us, enclosing us into a small cavern that manages to be comfortable and interesting at the same time. It’s only April, and nights are still chilly in Cappadocia: heavy blankets are piled on top of us, and the outside world seems a distant, chilly dream when the alarm clock lets us know it’s dawn. 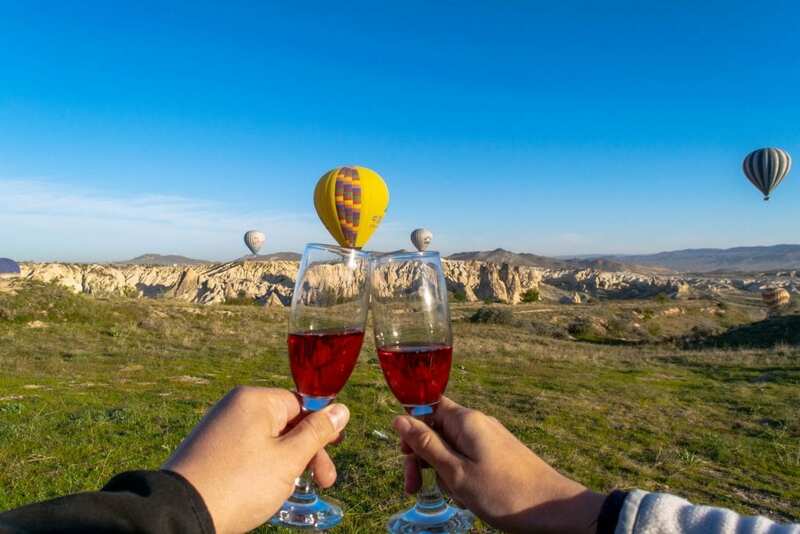 For our final morning in the region, we originally planned to make our way to the Instagram-famous Sultan Cave Suites to take some beautiful photos from their terrace of the hot air balloons dotting the sky. Now, though–now it is cold and dark outside, and warm and cozy in here–nothing feels less inviting than the prospect of shivering in a pretty dress and fighting through crowds to take our own version of an already-famous photo. We promptly kill the alarm clock and burrow a little further into the pile of blankets, all thoughts of morning photography quickly abandoned: this is much better. The sunset seems to stretch on forever. We are balanced precariously (along with several dozen of our closest friends) on some of the rock formations of Cappadocia, staring out at a landscape unlike anywhere else in the world. People clamor closer and closer to the many edges, eager for the best photos and the best views of the Cappadocia sunset. I battle with my fear of heights to stay in the spots with the best views: I don’t want to miss this watercolor of orange and red dancing across the sky, even if the anxiety currently settled somewhere behind my belly button is begging me to retreat. The colors are too beautiful to look away from. 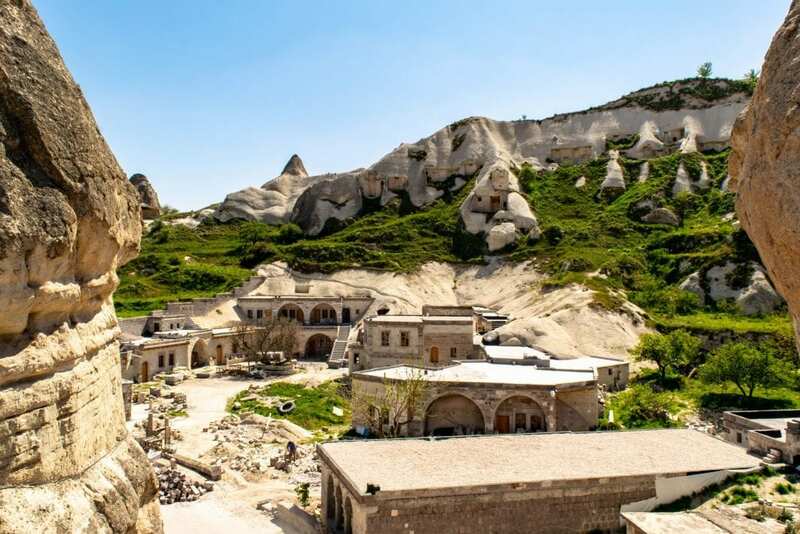 One day, we’ll return to Cappadocia–perhaps with a longer Cappadocia itinerary–and I have no doubt it will still be just as magical as this first visit. Divan Cave House — We loved our little cave suite here! The prices were reasonable, the breakfast tasty, and the suite incredibly cozy. 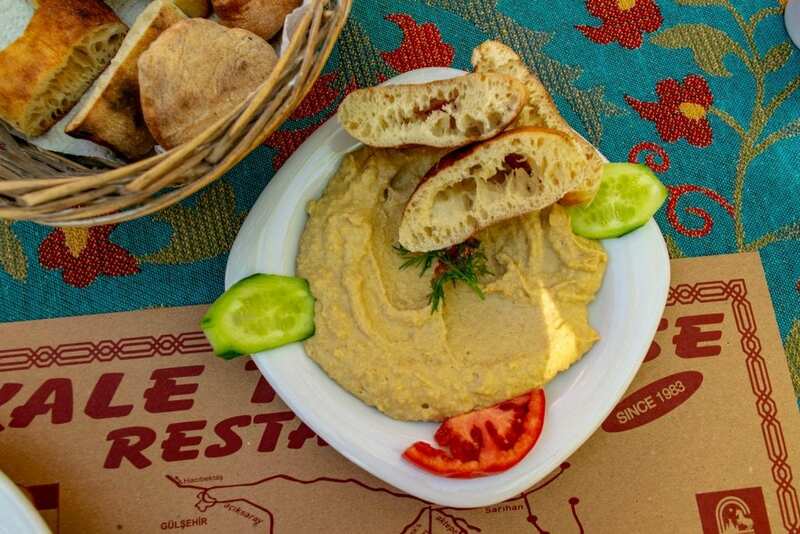 Divan Cave House is about a 10-minute walk from the center of town, and is on a quiet street at the top of a hill, which means there are great views from their terraces!